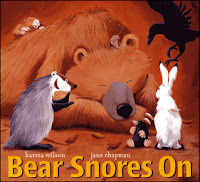 Story Time With the Library Lady: Theme of the Week: It's Novem-Bear! I am going to remind myself next year that post Halloween groups are zapped out from the excitement all the way through the week. Had a mom I really like tell me she was exhausted and it was SO nice to come to story time and let ME lead things. Which was fine with her darling rascal of a boy (youngest and sweetest of her 3 sons),but with some of the other kids, NOT! Add to that a plethora of accompanying and unruly toddlers NOT being restrained by parents and caregivers, and well, it was a helluva week. I didn't use this book on Wednesday because I had a big enough crowd to move out of the story room onto the main floor, and this book isn't big and bold enough for that. But I did use it Tuesday. Most of the kids know this series by now, but this is the first and (I think) the best in the series, and they love to join in on the refrain: "But the bear...snored...ON!" I fell in love with this book the day I met it and I've loved it ever since. The bold artwork is irresistible and worked even with a large crowd. Big Smelly Bear is every child who doesn't want to take a bath and Big Fluffy Bear is every sweet, forbearing (sorry)parent who has to convince her child to do so. I just wish that Teckentrup had allowed one final page revealing Bear in the pond--showing him in the pond gives away the ending! Sometimes when things don't go well Tuesday and Wednesday I toss everything out for my Thursday afternoon crew. I really wanted something different to get this program going, and remembered at the 11th hour that I had a big book version of this story upstairs. It was a great way to open up, especially when at the end I could ask "But where was the bear?" 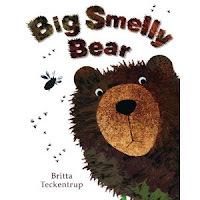 One of the kids knew that there is bear on the back cover, but that's just a shadow, so we discussed how you could fool someone by making a shape with your hands in a shadow! "Sody Salleratus" has been one of my favorite stories to tell for many, many, years. I never get tired of it, because as I keep saying, a story is never the same way twice. 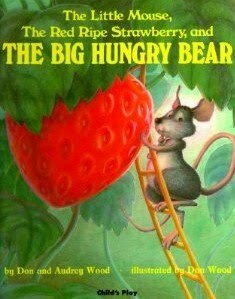 I've told this story to school aged kids and here I especially enjoyed telling it with my 3 to 5 year old crowd on Thursday, but one tiny 2 on Wednesday did some of the most enthusiastic "One..Big...GULP! "s that I have ever seen! My version is based on Margaret Read MacDonald's, and if you want to tell stories I'd recommend you hunt down "Twenty Tellable Tales" which is one of the books that really got me started as a storyteller. Terri Sloat has a good picture version of it as well--a patron mentioned they had borrowed it and recognized it as the story I'd told them last summer! "The Bear Went Over the Mountain" is a natural here. You could use a flannel board for this I suppose, but I am perfectly happy having the kids make a fist of one hand as the bear and having it climb up their other arm. Then we shade our eyes for "to see what he could see", and point to our other arms for "the other side of the mountain"
"Big Brown Bear" is on Kira Willey's "Dance for the Sun", the same place where I got "Making Apple Pie" for a September program. They are songs she uses in yoga for kids, and I modify them to use them with easy movements even my 2s can do. I also changed the last verse a little so that at the end the kids were curled up and sleeping in their caves--today's 3-5 year olds were extra good at that. You can get the words here and get part of the tune/download tracks at Amazon.com or CD Baby. And now I am going to retreat into my cave--err, go home and make dinner. And tomorrow, think about next week's program!